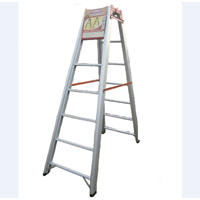 Folding Staircase Aluminum Brand MasterLadder is a construction tool that serves as a liaison between vertical fields to reach the horizontal plane. The ladder has two types: permanent and non-permanent. Permanent stairs are usually located inside buildings and used as interconnects between floors of different buildings. The folding ladder is one of the non-permanent ladders used to reach the higher horizontal plane. the second is the folding ladder and the use of folding ladder is used only at certain times so that it can be moved or stored.The folding ladder itself is a device designed to contact two vertical levels that have spacing each other. These folding stairs are usually used by field workers in construction, electricity and telecommunication. These stairs are often used because they are easier to carry and store.We produce our own folding ladder brand Queen and brand Master, our production folding ladder made of aluminum with thickness above the standard folding stairs that circulate in the market today so it will be stronger and durable in its usefulness. Following some kind of folding ladder of our production:High Aluminum Foldable Ladder 1 MeterHigh Aluminum Foldable Ladder 1.5 MetersHigh Aluminum Foldable Ladder 1.75 MetersHigh Aluminum Foldable Ladder 2 MetersHigh Aluminum Foldable Ladder 2, 25 MetersHigh Aluminum Foldable Ladder 2, 50 MetersAnd so on according to your order.refine. Folding Staircase Aluminum Brand QueenLadder is a construction tool that serves as a liaison between vertical fields to reach the horizontal plane. The ladder has two types: permanent and non-permanent. Permanent stairs are usually located inside buildings and used as interconnects between floors of different buildings. The folding ladder is one of the non-permanent ladders used to reach the higher horizontal plane. The folding ladder is used only at certain times so that it can be moved or stored.The folding ladder itself is a device designed to contact two vertical levels that have spacing each other. These folding stairs are usually used by field workers in construction, electricity and telecommunication. These stairs are often used because they are easier to carry and store.We produce our own folding ladder brand Queen and Brand Master, our production folding ladder made of aluminum with thickness above the standard folding stairs that circulate in the market today so it will be stronger and durable in its usefulness. Following some kind of folding ladder of our production:High Aluminum Foldable Ladder 1 MeterHigh Aluminum Foldable Ladder 1.5 MetersHigh Aluminum Foldable Ladder 1.75 MetersHigh Aluminum Foldable Ladder 2 MetersHigh Aluminum Foldable Ladder 2, 25 MetersHigh Aluminum Foldable Ladder 2, 50 MetersAnd so on according to your order. Double Teleskopic Fold Ladder can be formed into triangles and can also be a straight staircase. This type of ladder can be raised and shortened. Practical in use, easy to carry everywhere, also easy in terms of storage. 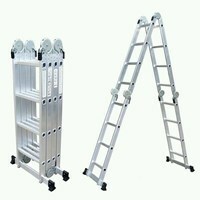 This folding ladder is made of thick aluminum material so it can for a maximum load of 150 kg. Available size 3.8m; 5m and 5.6m. 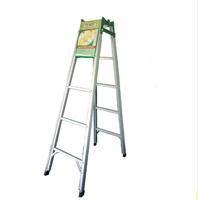 Multifunctional folding ladder is a combination of straight folding ladder function and triangular folding ladder. Basically this type of ladder is a triangular folding ladder. With this combined, this ladder can be a straight staircase. Thus, just with one ladder, you can shape it into two functions, triangle or straight. 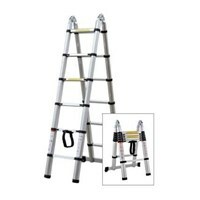 This multifunctional folding ladder is equipped with a ground strip on the bottom on its foot. The goal is to be more stable when made straight ladder with maximum height. 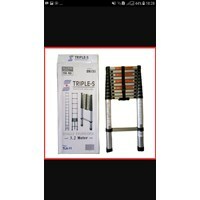 In triangular shape, the ground strip certainly adds to the sturdy ladder that is basically sturdy.